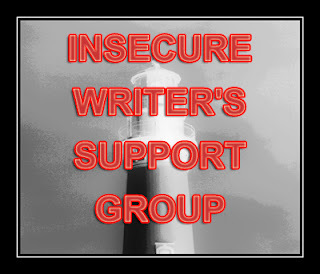 Focused on Story: Insecure Writers Group--Who Knew? But wait a minute...who believes writers are insecure? Afterall, aren't writers the ones who brave speaking in front of small groups as well as to crowds at famous writers' conferences? Aren't they the ones who are talking with folks one on one at library gatherings, flea markets, festivals, and even in school rooms? Let me tell you a secret. Writers are great actors. When getting up in front of a group, our guts are squirming and our knees are knocking together so loudly, we hope the crowd can't hear them. Sometimes a quick race to the bathroom precedes the eloquent, enlightening, entertaining talk to the audience. Yeah, we're just a bunch of adolescent kids in adult bodies scared to death we will make fools of ourselves and disappoint the people we care about. But somehow, we are driven to share our writing with others in order to brighten readers' lives. We want to make people laugh or shed tears or just feel something. So we act like we are self-assured in order to give a piece of ourselves to readers. And it is exhilarating and so worth it--when it's all done! Please take time to hop over to other blogs and hear their voices. You can find a list at Alex's IWSG page. Hey Suzanne, you are so right! I like you can talk the hind legs off a donkey! Thanks for stopping by. Welcome to IWSG and congrats on the brave admission of insecurity! It can be tough to drop the bravery act. I am co-hosting ISWG this month and want to welcome you to our group. You know, speaking in public is the #1 fear people have, more than cancer and death. I find that mind-boggling. My fear is not the speaking in public, but other aspects of marketing, even tho' that's what I did professionally for 30+ years. Good luck to you in your writing journey and look forward to connecting more with you. welcome to the IWSG group. Thanks so much for your welcome and leaving comments. I've had a lot of fun visiting the blogs, but oh my goodness. I wish I could hop onto every one of them. So much talent and support. Looking forward to the next month's posting. So happy to see you here, or for want of another greeting, It's about time! Happy IWSG. There's a saying - fake it until you make it. I faked it long enough it no longer scares me. Well said, JQ. Sometimes being something is more about pretending than actually being. Thanks, Misha!! And thank you for the welcome. I may not survive publication...well, maybe publication, but definitely NOT book signings.